There are a lot of ways in which people behave badly on the subway: There are the people who refuse to move all the way into a car. The people who lean on poles so you can't hold on to them. The kids who walk down the platform reeeeeeally sloooooowly. The leg-spreaders and the "my bag needs this seat" people and eaters of strong-smelling cuisine and the woman Jessica saw the other day whose kid smeared actual snot on the window. But the people who refuse to give up their seats for disabled or pregnant people are the worst, especially if they're sitting in the dedicated disability seats. In the past, this behavior has gone unpunished here on earth. But now a guy has dedicated a blog to posting their photos. 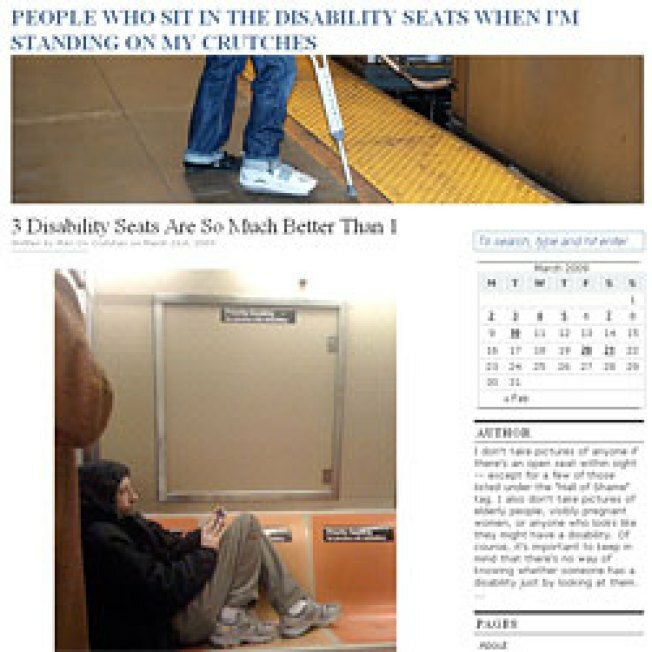 It's called "People Who Sit in the Disability Seats When I'm Standing on My Crutches." Don't get caught on it!